As South Floridians, our homes are always under constant threat of major rainstorms, hurricane season, tropical storms, and other inclement weather systems that crash into us every single year. 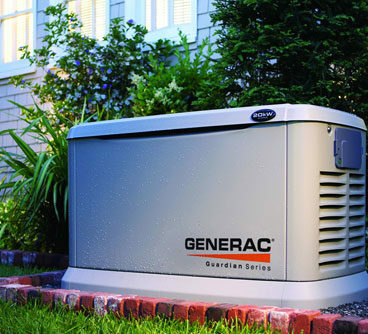 We rely heavily upon our standby generators to keep our homes up and running through the heaviest of storms. However, many of us get our generator installed and that’s the last time we pay attention to it. There’s no worse feeling than noticing that your generator is damaged or working improperly right before a hurricane or another massive storm is heading your way. Having a functioning standby generator is the difference between enjoying all the amenities of your home during a hurricane and sitting in the heat and darkness as the rain and wind cause chaos outside. We here at Rack Electric know how important it is for your generator to be running at peak efficiency all year long, which is why we offer generator repair services. Living in Florida means that we leave our generators open the elements all year long. This includes anything from daily torrential downpours to heavy amounts of humidity. Your generator is constantly exposed, which may lead to it needing some serious repairs. Rack Electric is able to provide its generator repair services to homes through Boca Raton and South Florida. We’ll dispatch a team of expert electricians to get to the root of the problem and repair it as efficiently as possible. Our electricians will assess what the issue is and what they need to make the repairs. The team will then get to work repairing it as efficiently as possible. We ensure you that our electricians will have your standby generator back up and running, so you can rest easy knowing that your home is ready for whatever may come its ways. While some things are out of our control, we can minimize the number of last-minute repairs your generator might need during its lifetime. We’re able to eliminate any and all breakdowns thanks to Rack Electric’s generator repair and maintenance program. We’ll work with you to schedule dates where we’ll perform regular checkups on your generator. Our electricians will make sure that it’s at 100% and doesn’t have any current issues affecting it. Our maintenance program allows us to ensure that any outstanding issues are taken care of right away, so you have peace of mind knowing that everything is running smoothly. 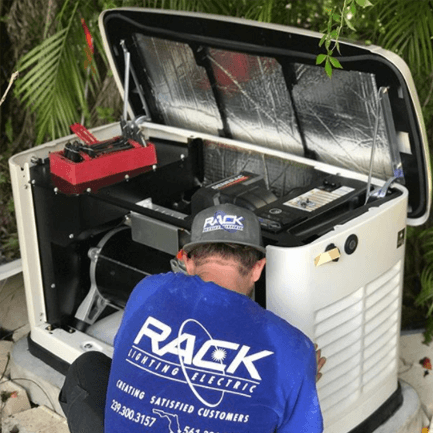 If you need Rack Electric’s generator repair services or are interested in our maintenance program, contact us today at (561) 391-3550.